Why I chose to produce ERIC in 2009. ERIC systems are already being built or used in most parts of the world right now as some photographs will show on this website, I predicted this would happen several months ago simply because the principles, applied correctly, produce incredible results over all other forms of Koi pond filtration. I also predicted, a few months ago, that this system would become the choice of most serious Koi enthusiasts within 18 months or so – I back that statement even more-so today. I came up with the very early and very basic principles of today’s ERIC river systems in early 1986 after first realising the biological performance possibilities of using cartridges tailored from Japanese filter mat sheets and simply turning them on end to greet a horizontal flow of incoming water held tightly within a narrow and shallow channel. I first put these units on sale in late 1986. It was not until 1995 before I gave a few important pages in ‘Koi Kichi’ to this horizontal-flow method (a part of the book which few actually read) and again covered it in a smaller way when I released ‘Koi2Kichi’ in 2004. Even in those early days I considered horizontal-flow to be a simple yet superb way of providing perfect filtration to a fishpond. The more expensive filtration systems in ‘Koi Kichi’ used this material exclusively in the biological stages and it was only after the book hit the desired mark that other continents such as South East Asia and the USA began to import it in any real volume quantities for use in their own filter systems. Whilst the ERIC systems of 2010 are truly light years ahead of my earlier designs, they are still based on the same early principle of the horizontal-flow of water (like a river) as opposed to upward-flow; downward-flow (as in shower systems) and pressurised units. All of these ‘modern-day methods’ used by many right now will be fully explained in great detail later. 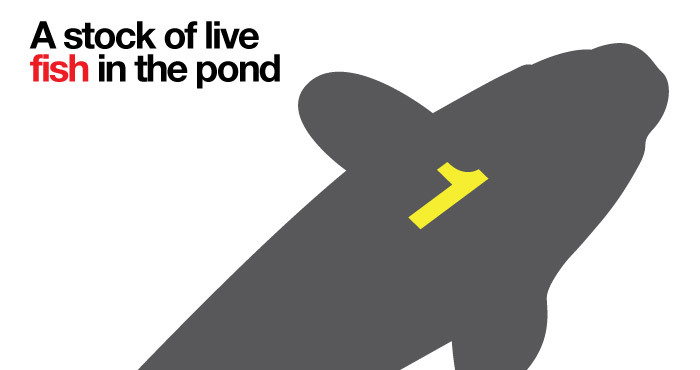 In late 2008 I decided to introduce and promote the untapped future possibilities of the original idea to other Koi enthusiasts by way of a simple DIY box formed out of concrete under the name of ‘Endless River In Concrete’ and abbreviated it simply as ERIC. There were several Koi enthusiasts around the world who latched onto this and have since built their own systems as specified on my website. After finally building the ready-made boxes myself, which are all highlighted later on this dedicated ERIC website, I found it was far more economical and much simpler to build and install by way of the ready-made version. As to WHY I decided to produce these systems, the answer is simple. All ready-made alternatives marketed around the world today are, at best, dated and little less than being exactly ‘efficient’ in actually doing what they profess to do in respect of keeping top quality Koi in top condition, full and logical reasons for this will be given by way of some animations and simple facts later. It should be also painfully obvious that if this can be achieved with the the most valuable of Koi pedigrees produced today then the same water will be of great benefit to ALL other Koi produced – irrespective of their quality. Alas, before now, this elusive ‘Koi Water’ has yet to be achieved and, whilst the breeders of Japan continue to better their annual production, the world lags behind on outdated filtration principles that have never even had the vaguest possible chances of working properly in the first place. 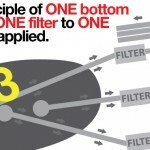 However, as I have said many times before – ALL filters ‘WORK’ to some degree or another! On my main KoiKichi website I point out the problems produced by poor filtration under the page heading of ‘The Three Big Downers’ which are responsible for significant numbers of high-end collectors giving up the hobby over the years. On another part of the website I have pointed out why the Japanese breeders cannot come to our assistance here because they have no experience in keeping their stocks in a man-made, enclosed recirculation system, using open filtration methods, for any longer than nine months in any given year. I have also given reasons as to why these Japanese breeders do not suffer with ‘The Three Big Downers’. The main reason for this is that the Japanese breeders can and do empty and clean out their indoor ponds/filters completely every nine months or so and these are left drained for a further 90 days whilst stocks are in the field ponds. This very same process can be carried out perfectly with ERIC systems in LESS than two minutes and as OFTEN as one wishes to no detriment at all. Whilst the rest of the Koi world keeps on producing items to ‘enhance this’ or ‘buffer that’ or ‘add this from time to time’ or ‘mix and trickle this’ or ‘do water changes’ and ‘bolt this on’ and ‘include this in the return line’ and many other such forms of nonsense which are only there as an attempt to make money by disguising and further complicating the ‘filter systems’ already purchased – how about we take a very close look into the REAL reasons as to why our Koi are not nearly in the best shape they could be? To be specific, how about we take a very close look at the boxes that are supposed to produce these desired conditions – namely the pond but more specifically the filter system, and this is the REAL culprit! ‘Please ensure your system is as perfect as possible before you even think of buying any quality Koi’. Back when I built my first pond some 37 years ago, I knew everything there was to know about building a fishpond, doesn’t everyone – silly? You dig a hole, waterproof it and fill it with water – that’s it, can anything possibly be simpler? It then took another seven years of failure after failure with items such as plastic drums; miles of pipelines; tank connectors; sand filters; perforated pond liners; burned-out pumps; dead fish, enormous telephone bills and a host of other nightmares before I finally realised a bottom drain may just possibly be of some use. Of course, in those days there were none available anywhere on the planet and those I mentioned them to just stared at me in wonder. In the end I had to design them and have them made up to my requirements. It took a further three years to convince anyone as to how vital they were if they were attempting to keep Koi in their ponds. When gravity-fed systems were first employed one year later, the idea was viewed by many as something out of the pages of one of Jules Verne’s novels. ‘Lash-ups and very costly compromises’ are still here today in their millions regarding Koi ponds and filtration systems and they will remain to be with us forever simply because everyone on the planet knows how to build a fish pond. This is not my concern, despite the fact that human nature will lead thousands of people to purchase millions upon millions of pounds worth of useless items, this, together with heaps of dead fish will all be taken to the waste tip at the end of it all after realisation finally sets in. My concern is simply the pursuit of producing ‘Koi Water’ for myself and some other like-minded Koi people around the world. I am also VERY aware that this is a minor pursuit for only a few silly individuals like myself in the world today who are completely dedicated to giving the best possible water for their Nishikigoi. The truth of it all is that building a simple ‘proper’ Koi pond and a simple ‘proper’ filtration system is still about as ‘simple’ as is building a television or a motor car. 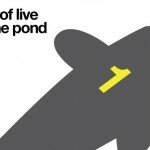 Right now in 2010, I personally know of only 20 or so systems in the world today that can be termed as ‘Proper’ Koi ponds. Hence the reasons for my production of ERIC systems and thus ‘KOI WATER’. ERIC also works on the simplest and most obvious of principles that everyone can easily identify with almost instantly – however it takes an entire website such as this one to try and explain them properly and in full! Providing that this website is first read and and digested – it will show exactly HOW ERIC works and exactly WHY ERIC works AND in very great detail. 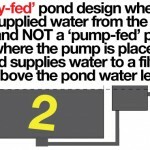 Before I continue, is your pond design or proposed pond design suitable for ERIC filter units? If these three requirements cannot be met then ERIC units will not perform to their maximum potential and I therefore suggest you look elsewhere for filtration units. There are many other filtration manufacturers out there who have no such restrictions in place before offering their units for sale. I will quickly explain here why they are vital for the perfect running of all ERIC units. A stock of live fish is vital to provide the dissolved toxic ammonia given off and produced in gill action and urine by the fish stocks within the pond. This produces a ‘heavier than water’ concentration, which although completely invisible, falls naturally to the pond base. The operation of the gravity-fed bottom drain takes this water supply into the filter system. It passes through the mechanical stage totally intact and is then taken onto and across inert surfaces in the biological stages of the box. Bacteria form on these surfaces – either naturally or with chemical aids – the bacteria takes in the dissolved toxins as their food source by way of two processes (ammonia to nitrite) to finally produce their waste products of relatively harmless nitrAtes which are returned via a pump back to the pond. In this way the fish in the pond rely on the bacteria in the filter to remove the toxins in the water that they produce and the bacteria on the surfaces of the biological stages take this in as their food supply. Once the bacteria have colonised these surfaces they reproduce and die at a great rate – this is when the surfaces have become fully mature and are now referred to as ‘a biomass’. Once a stable biomass is produced, if the fish are removed from the system, the biomass dies. Conversely, if the biomass is destroyed, the fish will die in their own toxins. If a proposed pond system requires no fish stocks then a far easier way of filtration can be purchased similar to the ones aided by chemicals and used in swimming pool applications. This is simply where the standing water levels in both pond and filter stages are identical. The bottom drain provides the link from pond to filter – usually by way of 4” (110mm) open tube. The system pump is fitted at the last stage of the filter box as shown and this pumps water back to the pond. The action of this is that, once the pump comes into operation, the water level in the filter reduces slightly whilst, at the same time, the pond water level increases slightly. This produces an imbalance of levels, which is compensated for by natural gravity. The increased head (weight) of pond water drives water out of the only available exit – in this case, the bottom drain and the water then passes along the drain line and back into the filter stages. Thus the system continues to operate in this way permanently via the system pump. Not only does the vacuum effect of a good, well-placed bottom drain operate perfectly, there are also other benefits above the ancient pump-fed systems (nowhere even near as efficient and extremely laborious to maintain) whereby there are no unsightly pumps, pipelines and electricity supply cables seen in the pond. Whilst there are ways to pump-feed (and thus sell more) ERIC units by way of a relatively uncomplicated return outlet, the main reason I have against this method is that placing a pump on the base of the pond is almost useless – this is nothing to do with ERIC at all! In view of this I do not recommend you consider purchasing ERIC units for any ‘pump-fed’ applications. 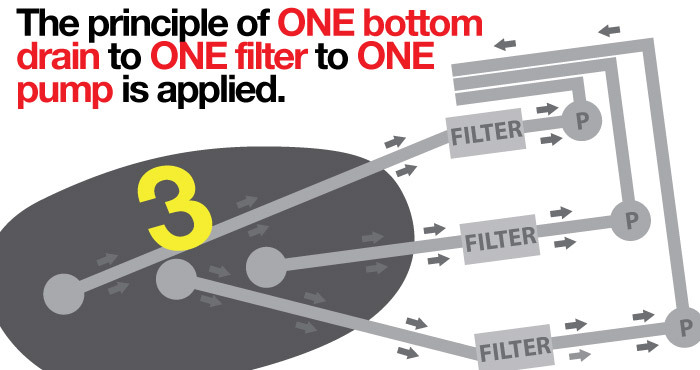 The principle of ‘One drain to One Filter to One Pump’ as shown here is also absolutely vital and clearly obvious when considered, as multiple drain lines cannot be taken into a common filter box without total failure as shown here. The above example is of a design commonplace in the late 1980’s. In actual running, the drain nearest the filter supplies over 90% of the water, the middle one supplies 10% and the one on the left supplies nothing. Only the pond base on the nearest drain is being serviced correctly which results in an expensive failure. 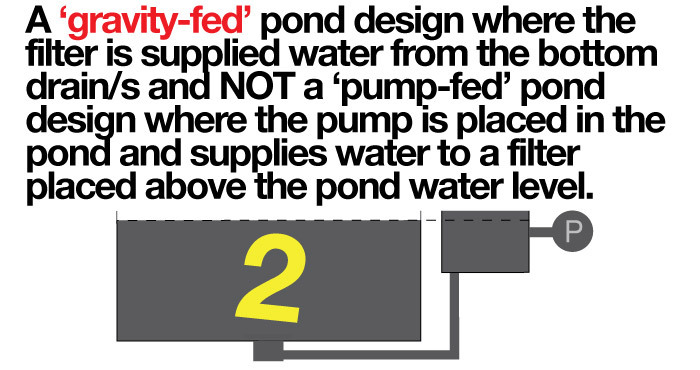 The design below shows the ‘One Drain to One Filter to One Pump’ principle absolutely vital today if the entire pond base is to be serviced correctly.